I Believe In Bat-Mite: Batman: The Brave and The Bold Episode 45 - "Emperor Joker!" Batman: The Brave and The Bold Episode 45 - "Emperor Joker!" Synopsis: The episode begins with a teaser entitled "The Rainbow Batman" (in color) under the banner of Batman's Greatest Cases. Batman is seen putting on a red (pink) Batman costume and, when questioned by Robin, tells him that he must wear a different colored costume every night. The show then cuts to the gold depository where Firefly is breaking into a vault, only to find the Dynamic Duo already inside. When he fires a red beam from his belt at the pair, Batman is able to deflect due to his costume being the same color. Not ready to come quietly, Firefly activates all of the colors on his belt and creates a rainbow creature. The creature has different colored beams each with their own power, using one of them to turn Robin into a two-dimensional state. Batman presses a button on his belt, transforming his suit into a rainbow one. Now impervious to the creature's beams, he punches it into little more than light and knocks out Firefly soon after. The main story begins with the Ten-Eyed Man about to rob a jewelery store, when Batman speaks from above him. The fight barely begins when Bat-Mite pops into reality, advising Batman about the Ten-Eyed Man using Who's Who #23. Batman reminds him about his promise to stay in his own reality and then picks his fight back up, leaving Bat-Mite to continue reading the Who's Who entry. Bat-Mite eventually helps his hero by creating a cactus, which Batman throws at the Ten-Eyed Man, who catches it with predictably painful results. After Bat-Mite expresses wanting to see Batman in a fight worthy of the Caped Crusader, he takes Batman to his shrine of all of Batman's greatest battles with his arch-enemy The Joker. When Batman says he won't be battling the Clown Prince of Crime since he's in Arkham, Bat-Mite uses his powers to allow The Joker to escape. Batman brings Bat-Mite along to stop Joker from robbing Gotham's Comedy Museum, albeit on the condition that the imp not use his powers. Bat-Mite agrees and gets the fight he was wanting, as Batman not only has to face off against The Joker, but Harley Quinn and four of The Joker's goons (with appearances that resemble silent film comedians). During the course of the fight, Bat-Mite becomes smitten with Harley Quinn, perhaps because they both feel that Batman and The Joker bring out the best in each other. Eventually, an exploding hand allows The Joker and his henchmen to gang up on Batman. While keeping his promise to Batman, Bat-Mite finds a loophole to help his hero by giving his powers to the Caped Crusader. Unfortunately, the transfer misses Batman and hits The Joker instead. While The Joker uses his newfound powers to subdue Batman with a giant boxing glove and force lightning from a joy buzzer, Bat-Mite is left to deal with a Joker-Mite created just for him. After an impromptu musical number of The Joker celebrating the power he has gained, he sets off the equivalent of a "Mouse Trap" that appears to kill Batman. While The Joker at first mourns the death of his adversary, he brings Batman back to life so that he can kill him again and again, utilizing a giant beaker of acid, flamethrowers, sharks, and other scenarios. As for Bat-Mite, he has been reduced to a court jester thanks to Harley Quinn intervening on his behalf. Batman appears to beg for The Joker to stop killing him and take away his sanity instead, an idea that The Joker delights in and plans to go into Batman's head to do it himself. When he does, Batman outsmarts him by placing him in a world where Batman does not exist and therefore The Joker has nobody to match wits with and ceases to be who he is. Meanwhile, Bat-Mite and Harley Quinn team-up to take down Joker-Mite and the rest of Joker's gang. The episode ends with Bat-Mite returning the world to normal, The Joker left drooling from his encounter with Batman's mind, and Bat-Mite having his own arch-nemesis in the form of Joker-Mite. Thoughts: Before I talk about the main story, I have to touch on the teaser segment. You can tell how aware the crew behind the show are when they turn the infamous "Rainbow Batman" cover into a cartoon. While it does not follow the plot of the story behind the cover, they created a new, more fantastical story that fits into the Silver Age mold. They even bring in other fifties era stories, as Firefly and his light belt debuted in Detective Comics #184 and the Rainbow Creature appeared in Batman #134. Even before the real story has begun, the episode has woven three stories together into a fun wink at the fans who know about them. Of course, the main attraction is Bat-Mite in his second appearance in the series and it is another great one. As Bat-Mite is Batman's biggest fan, Melching takes that concept and applies it through the lens of the 21st century comic book fan. 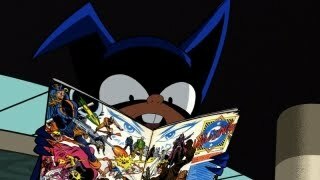 Not only does Bat-Mite read the Ten-Eyed Man's Who's Who entry, but he bags the comic and puts it into a longbox. He comments about how much he loves Batman's show, which refers to both that Batman: The Brave and The Bold is a cartoon and that Bat-Mite's observing Batman is like watching television for the imp. In his shrine to the Batman/Joker fights, he has replicas for the fifties story "The Joker's Utility Belt," as well as the more modern stories "The Laughing Fish" and "A Death in the Family." For the latter, Bat-Mite even asks Batman how he thinks Bat-Mite voted, calling back to the fan vote over whether Jason Todd would live or die. This playing up of the fanboy aspect of Bat-Mite is not a cruel jab, but rather gives comic fans an opportunity to laugh along with the show. But Bat-Mite's fanboyism is not the only interesting aspect of the character in the episode. I have to imagine that Bat-Mite's crush on Harley Quinn is a call back to Bat-Mite's crush on Batwoman in "Batwoman's Publicity Agent" from Batman #133. Bat-Mite's attempt at transferring his powers to Batman keeps the Bat-Mite story element of the imp's attempts at help causing Batman more trouble, while showing he respects his hero's wishes (even though Bat-Mite transferring his powers to Batman is a use of his powers). The Joker-Mite is a fitting concept that one would expect to see out of a Silver Age comic and Bat-Mite's defeat of him without his powers mirrors Batman taking down supervillains without being superpowered. In contrast to the fun Bat-Mite elements are the darker Joker elements. In the series, the more harmless Silver Age Joker incarnation has been played up more than the homicidal clown. This episode, however, brings out the more murderous side of the character. While Batman is not shown dying, the episode leaves little to the imagination. When Batman is smashed by a giant hammer and crushed by a pair of walls on camera, and when he is beheaded by a guillotine off camera, there is no blood, but the sound effects emphasize what is happening. When Batman is drowned in the acid beaker, his skeleton floats toward Joker and a distraught Bat-Mite. While cartoony (down to a transparent angel Batman floating upward after his first death), the montage of Batman deaths shows how sadistic The Joker is and is pretty macabre for what is seen as a children's cartoon. Not that I am complaining mind you, as it is what Joker would do if he had potentially unlimited power (and did in the original comic storyline, albeit with Mr. Mxyzptlk's powers). Keeping with The Joker's character, touches of humor are added to the deaths. In the initial "Mouse Trap" death, Batman gets out of the spike filled coffin that will supposedly kill him, only for the trap to continue and the hammer to crush him. When Batman is about to be dropped in the beaker of acid, he starts to give an encouraging speech to Bat-Mite when The Joker cuts the rope before he can finish. The experience also shows that Batman's mind is so well disciplined that not only could he focus enough to come up with a plan, not only could his mind create a world that would show how The Joker's existence would have no meaning if Batman was gone, but that he could come out of dying multiple times still in possession of his sanity. By mixing the amusingly self-aware element of Bat-Mite with the morbid element of The Joker, the episode strikes a balance that allows Bat-Mite to shine and Batman's mental prowess to be examined.